Dubai, United Arab Emirates, 5 November 2018: IKEA, the region’s favorite Swedish home-furnishing retailer, maintains its promises of quality and customer satisfaction, with its guarantees of up to 25 years for a vast selection of its products. 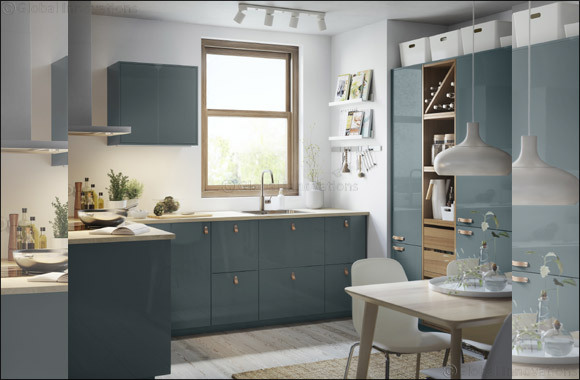 Maintaining high quality standards, the IKEA product range is crafted to bring together elements of excellent craftsmanship and designer looks, promising the customer a product that not only looks good, but can also retain its superior build for a long time. Ranging from small products such as a hand shower to larger products like couches and kitchen systems, IKEA promises a build quality that rivals no other. With a goal to maintain the customers trust, IKEA is reputed for its attention to quality and its guarantees for selected lines of products. With such an immense selection, we have selected key products to highlight. The METHOD kitchen system and the HIDRASUND, a pocket spring natural mattress, comes with a guarantee of 25 years, which is perfect due to the frequency of use. On the other hand, a few other products such as the 3-seat sofa GRÖNLID, a PAX\KOMPLEMENT wardrobe with white Tyssedal glass doors, corner desk BEKANT, drawer unit GALANT, and many more come with a 10-year guarantee program. These include the swivel chairs, MARKUS and LÅNGFJÄLL, bathroom fittings such as the GODMORGON (wash stand), BROGRUND (shower), ODENSVIK (washbasin) and DALSKÄR (mixer tap). Meanwhile, some other products like VOXNAN, a chrome plated five spray hand shower, gets a three-year guarantee. Celebrating 75 years of IKEA legacy, the brand now houses some of the latest designs and quality craftsmanship that allows customers to furnish their home to suit their every need. Reflecting on its Swedish heritage, IKEA also offers ideas of sustainable living and practical solutions in doing so.